Fitting bolt on dampers is very simple. How ever if you opt to fit dampers with the top brackets welded on, you will of course need welding equipment, or somebody to do it for you. The fitting of front dampers is a very worth while task to carry out to improve the handling of your Lambretta. Of course all 175 and 200cc models already come fitted with these as standard, but as the majority of Lambrettas consist of being either 125 or 150 engine sizes, these do not come fitted as standard. There are three ways to convert your machine to damper forks, one is to buy a 200cc set of forks with links, but a disc brake would also be needed, the other to is buy one of the two different types of kit available. Both of these kits use a bottom bolt on damper bracket, which simply fits over the current fork link to provide a stud for the bottom damper. One kit then provides you with a bracket as used on 200cc style forks, which needs to be welded into position on the forks. The other type is a copy of a sixties accessory, and provides a clamp for the top mounting. This latter method may be better if you forks have already been painted or you are unsure or unable to have welding carried out. The weld on type is no doubt the best way, but the bolt on type does work well also. The bottom brackets come sided, and are fairly easy to fit, I will at a later date get pictures here to help, but for now look carefully at the bracket and you will notice it will only fit one way. Remover the two hub nuts, fit the brackets and replace the nuts. 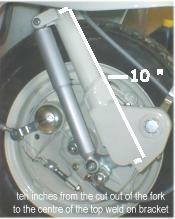 The picture above shows the measurements needed for the top bracket. One thing you might want to note is that the original Sebac shocks used, if you look very closely, extend just a touch to far. For a better looking set up if not using damper gaitors etc, lower this measurement slightly. Look at this smaller picture to see the difference, by lowering the top bracket slightly the damper looks much cleaner. Stainless dampers and or other types should not be affected by this. With the bolt on damper kit it is less important to worry about this, as with the bottom bracket fitted, you can fit the damper in position, and adjust the top bolt on bracket until you are happy with its position. With the weld on top brackets, you will of course need to bare the area of the forks of all paint, and weld the top brackets in position. The bolt on top brackets need to be fitted correctly, as the bolt of the top bracket is shouldered and can be snapped if you do not follow the instructions that should come with the kits.